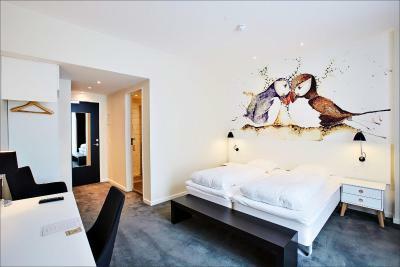 Lock in a great price for Hotel Hafnia – rated 8.4 by recent guests! Worked with us to find a room with separate twin beds as opposed to Nordic twins. 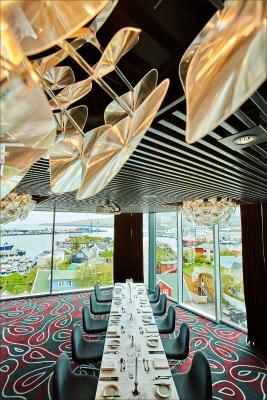 Location is near the harbor and some great restuarants. Real breakfast was included..
We were only here for one night, but the hotel was clean and nice and they served the best smoothies at the continental breakfast. Superb hotel right in the heart of Torshavn. Was upgraded to one of the refurbished rooms which was a pleasant surprise. Room was out of the main building but through a covered walkway which was fine. Bathroom had heated flooring which was lovely on the cool mornings. Great shower with great water pressure and hot water. Bed was very comfortable. Nice, blackout curtains ensured a good night's sleep. Breakfast was outstanding with plenty of different foods on offer - both hot and cold. The bacon was the best I've tasted - nice and crispy just the way I like it. All staff were very helpful and friendly. Use of a nearby gym was a brilliant addition. I loved every minute of my stay at this hotel and will definitely be back! The location is great! Also the facilities were very new and up to date, at least the room we got and the reception/dining hall. Just a 5 min walk from the ferry terminal where the airport buss stops, which was great for us since we had heavy luggage. The hotel was located within a block from the marina and the grass-roof buildings part of the city, excellent location. The room was very comfortable, and the breakfast buffet were great, there were a lot to choose from. Staff was great, and everything was like i hoped. I liked everything at the hotel, great atmosphere, and all the staff helped me with my problems. great location, nice staff. good breakfast. room was big, bed was nice, very clean hotel. will definetly stay here again. Room was perfectly nice. Staff were also very nice. We appreciated the free coffee for our early morning start. Hotel is very well situated and the KC restaurant around the corner (affiliated with the hotel) was wonderful. There is a guy in 22-25 years age working in the reception. I have been to many hotels and he is super service minded. Top class hotel staff! Helpful with showing what to discover on the island, helpful with the rental car, helpful when our flight was cancelled back and offered us anything he could to make it comfortable. And always with a smile on his face and very polite attitude towards the customers. Super!!! The atmosphere of the hotel is great, the staff was extremely helpful, made our hiking trips smoother. Furthermore the breakfast is also great. 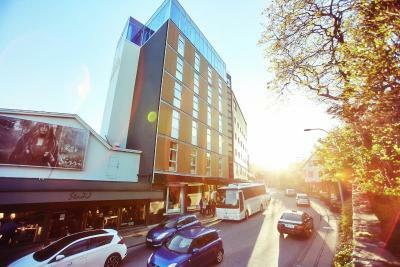 Hotel Hafnia This rating is a reflection of how the property compares to the industry standard when it comes to price, facilities and services available. It's based on a self-evaluation by the property. Use this rating to help choose your stay! 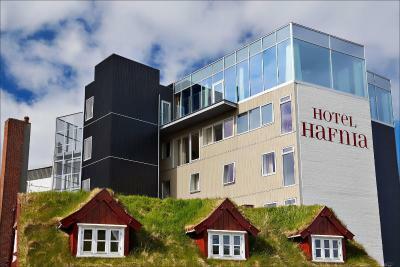 Hotel Hafnia is in Torshavn’s Old Town, right on the main street, Áarvegur. It offers free in-room Wi-Fi. 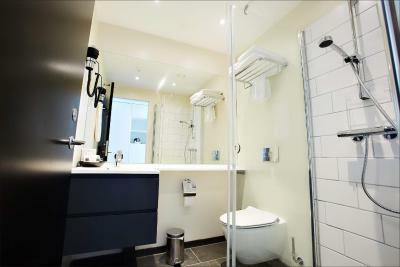 Guest rooms feature a mini-bar, tea/coffee facilities and a private bathroom with shower. All are equipped with satellite TV, and some include a seating area and free sauna access. 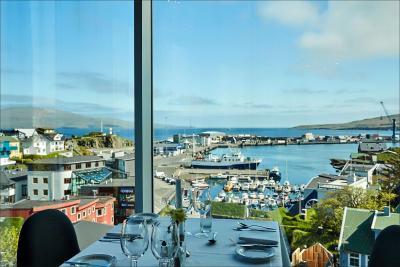 Hafnia Restaurant serves international cuisine as well as seafood and other specialties from the Faroe Islands. The popular breakfast buffet includes locally sourced ingredients. 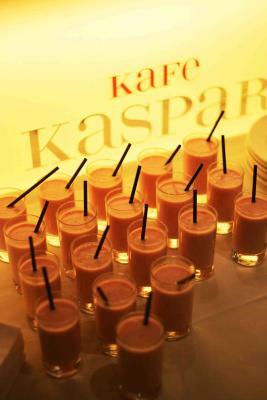 Bagels, salads and home-baked items are available at Kafe Kaspar. The airport shuttle stops right outside Hafnia Hotel, and the surrounding streets have shops and restaurants. Staff is happy to provide information on nearby sights and activities. 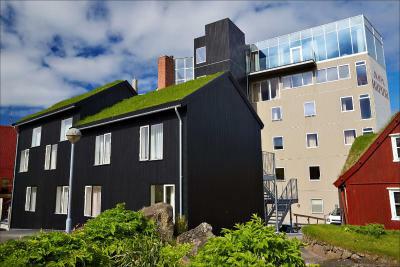 This property also has one of the top-rated locations in Tórshavn! Guests are happier about it compared to other properties in the area. When would you like to stay at Hotel Hafnia? Includes a mini-bar, satellite TV and tea/coffee facilities. 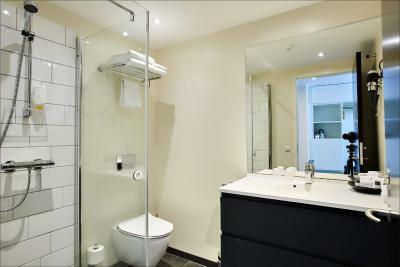 This spacious room has a seating area, flat-screen TV and tea/coffee facilities. It includes free sauna access. This twin room features a mini-bar, electric kettle and satellite TV. This single room has a mini-bar and electric kettle. House Rules Hotel Hafnia takes special requests – add in the next step! Hotel Hafnia accepts these cards and reserves the right to temporarily hold an amount prior to arrival. Please inform Hotel Hafnia of your expected arrival time in advance. You can use the Special Requests box when booking, or contact the property directly using the contact details in your confirmation. They didn't properly clean our room. We stayed for 4 nights and had the same bedsheets everyday, also they did not vacuum the room once. The breakfast was a bit boring but it had the basics. There were cars parked outside our entry so it was a bit difficult to get past sometimes if we carried our luggage. There is no car parking right at the hotel. You have to park in a 8 hours parking lot about 2 blocks away. You had to move the car out by 9 AM, and then come back later to park. At least it was free parking. I can not picked out anything, everything was great. Terrible noice from the party in the restaurant. Got sleep after 2am. Free sauna for guests. The location. The quality of the Food were excellent, but the variety could have been better. Parking is a bit inconvenient. If you arrive before 4 pm, expect to have to tend to your car at least once because everything is 2 hour parking til 6 pm. We parked about 2 blocks away in a lot by the water.